Christian brings global experience in sustainability strategies for social and environmental shared value. With a background in international development and a passion for fostering positive environmental and social impacts in our society, Christian’s leadership helps for-profit and non-profit organizations create new opportunities and innovative solutions to sustainability goals and challenges. 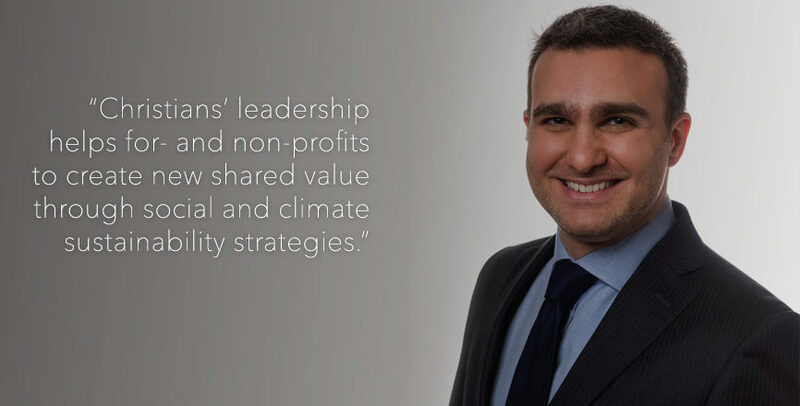 His expertise ranges from sustainability reporting and assessments to fundraising, from creating profitable partnerships for sustainable development to gender equity certifications. Christian can design CSR and shared value strategies for companies as well as circular economy programs with the surrounding communities in which they operate. In his most recent work, Christian has advised airport operators in Latin American countries and the U.S. on how to improve their waste management strategies in collaboration with their local communities and how to include their individuals in the airport supply chain operations. Christian earned a Masters in International Relations and Economics from the Johns Hopkins University School of Advanced International Studies (SAIS) and a bachelors in political science from the University of Catania. CPAC’s strategy and mandate is exciting and important work that we need to get right, for which we are always pleased to be working with SMI. © Strategy Management Institute 2016. All Rights Reserved.